Atletico Madrid have showed signs that they will appeal an 8-match suspension placed on Diego Costa by the Spanish Football Federation (RFEF) yesterday. 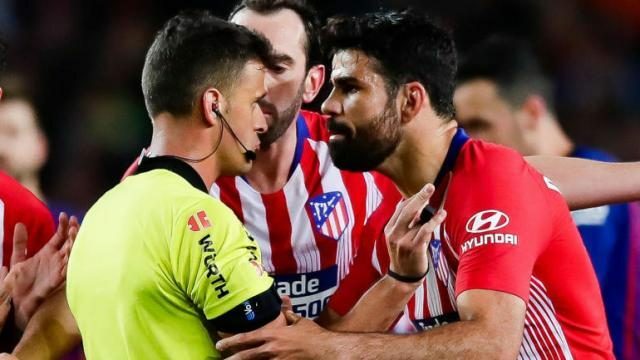 Costa saw red in the first half of Atletico’s 2-0 defeat to Barcelona on Saturday for directing a crude insult towards referee Gil Manzano. Manzano also disclosed that Costa had ‘grabbed him by the arms during the incident. The ban means Diego Costa will not feature anymore this season since Atletico have seven games left in La Liga, since they got kicked out of the UCL and Copa del Rey. Enrique Cerezo revealed on Thursday that the club will appeal against the decision. His words, “It’s bad news. The natural thing is for us to appeal, to ask for leniency and see what happens.